As much as I love a good night out at Christmas time, I'm also rather partial to a cosy night in. Tonight is mostly about the Strictly final for me but there are a few festive additions that make the whole night in thing even better. 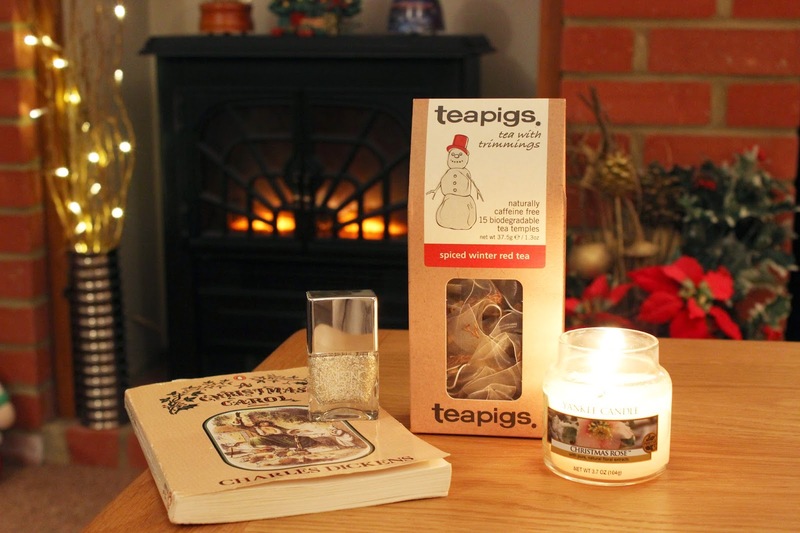 First up as a little change from mulled wine I'm loving the teapigs spiced winter red tea. I actually got sent this as part of my Christmas present from Benefit and it really is delicious, as well as being caffeine free so great for evening tipples. The candle will be no surprise given the amount that popped up in my birthday haul and tonight's Saturday scent of choice is Yankee 'Christmas Rose'- a lovely smell to unwind to. Activity wise once Strictly is over I'll be painting my nails with Nails inc 'snowflakes' and dipping into my favourite Christmas book, 'A Christmas Carol' by Charles Dickens. Oh yes, being a Saturday night sofa sloth in December is pretty darn delectable. What features in your Christmas night in?